And now he’s in the Hall of Fame. There was some grumbling on Twitter about 2006 Breeders’ Cup Classic winner and Horse of the Year Invasor, with his career record of 11 wins from 12 starts, being among this year’s inductees into the Racing Hall of Fame — “No offense to Invasor, who was very good in several races,” tweeted Marcus Hersh, “but if he’s a Hall of Famer, I kind of fail to see the point of the HOF” — but this Invasor fan heartily approves that the world-traveling, world-beating Argentine-bred will be enshrined in Saratoga. 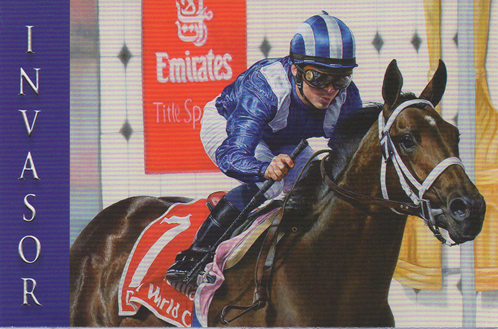 Nine of his wins were in Group 1/Grade 1 races, spread across three continents. That’s exceptional. Back in 2007, Hall of Fame voter Bill Finley wrote, “When the time comes, I will have a hard time voting for horses like Invasor …” Earlier this year, writing of his ballot, his position seemed less conflicted: “Invasor’s career was a brief one but he was the dominant horse of the middle half of the last decade.” Finley was obviously not alone in his evolution — that Invasor was a first-ballot Hall of Fame pick suggests that as careers have grown shorter, more guardians of the game’s history have begun to rethink what makes a horse plaque worthy.